Hayes High School students and community members work to load food into vehicles Tuesday morning. The donated food included a turkey, rolls, stuffing and sides. Drivers would pull up and tell the students how many people they had to feed and the students would load the appropriate amount of food into the vehicles. Hayes students organize the donations before the event began Tuesday. Donations were handed out around 10:45 a.m., and students worked for about an hour loading food items into vehicles. 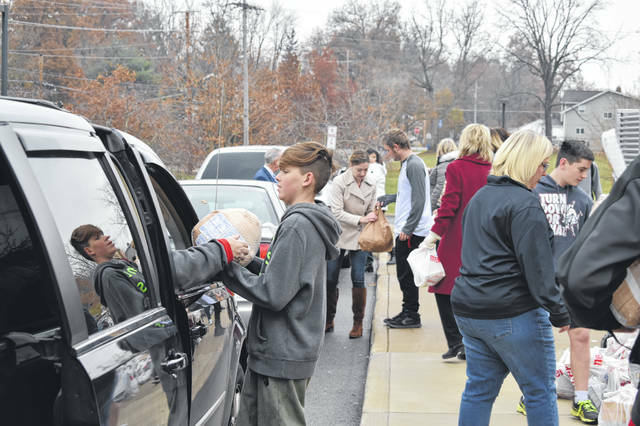 Dozens of cars lined the streets surrounding Delaware Hayes High School Tuesday morning as teams of students, staff, Delaware County Juvenile Court officials, and officials from the Delaware County Board of Developmental Disabilities handed out more than 200 turkeys and other food. This was the fourth year for the annual Fight Against Hunger Games event, where students in the eight houses at Hayes High School compete to see which house can raise the most donations. The event began as a partnership between the Delaware County Juvenile Court office and the high school, and it expanded to include the Delaware County Board of Developmental Disabilities two years ago. In 2014, the event handed out 50 turkeys, and on Tuesday, Lisa Williamson, the director of court services at the juvenile court, said this year’s effort had collected more than 200 turkeys, as well as mashed potatoes, stuffing, and rolls for Thanksgiving dinners. Hodge said the staff at the DCBDD enjoyed taking part for the second year and even had an office competition. She said one lesson they stress at the DCBDD is “contribute,” and said she was humbled to see cars wrapped around the block for the event. Delaware Hayes Principal Richard Stranges stood in the loop in front of Hayes and directed the flow of traffic during the event, while students and community members loaded vehicles with turkeys and other food items. Delaware County Juvenile and Probate Court Judge David Hejmanowski said the event creates connections between the students and the community. “For me, it’s cool to see kids handing out meals,” he said. After the event, the remaining food was taken to elementary schools to be distributed to local families as well as to the Pacer Pantry. Williamson added that the Lewis Center Meijer location donated a $200 gift card for the event, which Williamson and others used to buy turkeys.